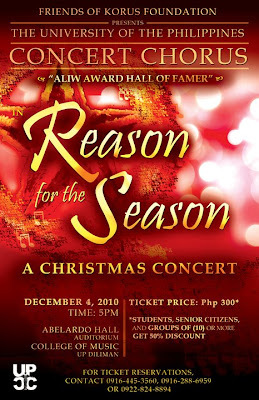 The UP Concert Chorus in "Reason for the Season"
The Friends of Korus Foundation presents, 2010 Aliw Awards Hall of Fame awardee, The University of the Philippines Concert Chorus (UPCC) in "Reason for the Season: A Christmas Concert" on Saturday, December 4, 5PM at the Abelardo Hall Auditorium, UP College of Music, University of the Philippines, Diliman Quezon City. Being an alumnus of this world renowned choir, I would like to invite all my blog's readers to this special Christmas concert especially because my first ever touring batch with the UPCC (Touring Batch 2000) is celebrating our 10th Anniversary this year. I will also be performing with batchmates in this concert! 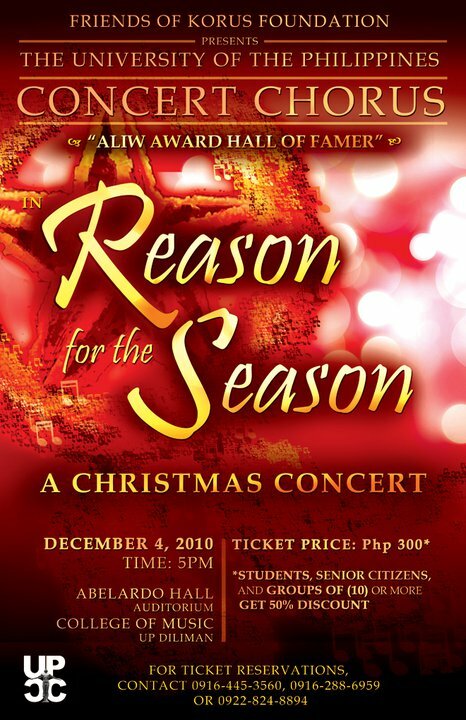 I would also like invite to all Bloggers who would like to watch The UP Concert Chorus in "Reason for the Season: A Christmas Concert" on Dec 4. Ticket prices are set at P300 with a 50% discount for students, senior citizens and groups of 10 or more. I will be extending this discounted price to all Bloggers who would like to watch the show. You can pick up your tickets at the gate on the day of the concert, and pay for it there as well, with a 50% discount, of course. Hurry because tickets are almost sold out!